Long lasting sharpness – with regular use can stay sharp for a few years and more. If it does need sharpening, most of the manufacturers will sharpen it for free. 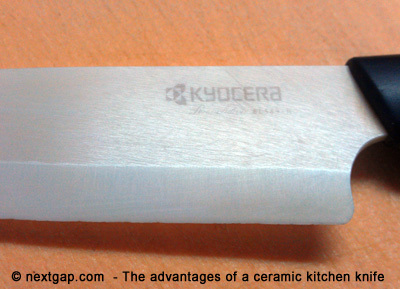 If you want to sharpen it yourself, you can purchase a ceramic knife sharpener. Ceramic knives can come in various colors, off white, black, etc. Just to be fair, the disadvantages of this knife is it being fragile compared to steel. If you drop it on a ceramic floor the tip can break. I don’t know how easy, but its a possibility. In every day use, its very durable. The model I have is a 4.5 inch blade. I would suggest you buy a at least a 5 inch one, and up to 6 inch, 5-6 inch blade, will be perfect for almost any job, vegetables, fruits and even meat.